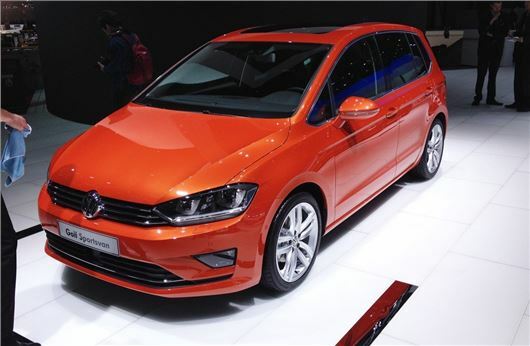 The Volkswagen Golf Sportsvan - or SV as it will be known in the UK - has been shown in production form at the Geneva Motor Show. The car, which appeared as a concept at Frankfurt in 2013 will replace the long-lived Volkswagen Golf Plus. The car is slightly larger than a Golf hatchback and so offers more interior space and a larger boot with 498 litre capacity as opposed to the Golf’s 380 litres. It's based on the latest seventh generation Golf. It's still a sort of half way house between a hatch and an MPV but it looks a lot better than the model it will replace. Volkswagen has also confirmed that it won't be called the Plus either, in the UK. Additionally there is more rear leg and head room and the rear row of seats can be adjusted for better comfort or a slight increase in luggage space, depending on the owner’s needs. Four petrol engines will be offered with outputs ranging from 85PS to 150PS and there will be three diesel engines with 90PS, 110PS or 150PS. The Volkswagen Golf SV is due to go on sale in the UK in mid 2014, with orders being taken from May.